Smile – It’s A Smilax! You are here: Home / Home Page / Smile – It’s A Smilax! 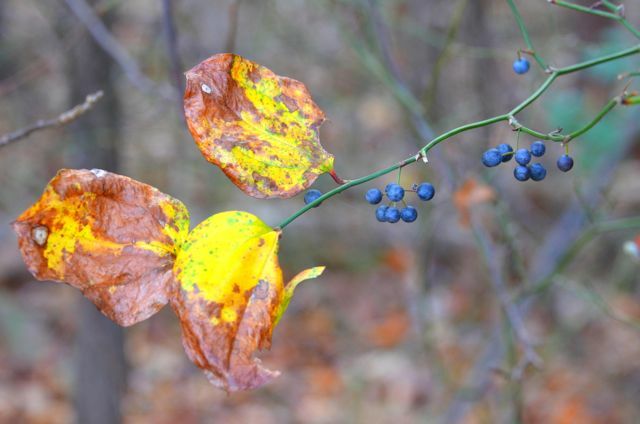 The genus Smilax is bound to catch your attention one way or another – your eye catches a distinctive green leaf; your nose detects a whiff of something slightly ‘off;’ your skin or clothes catch on sharp prickles as you walk down the trail. Those prickly Simlax have common names that include the words Greenbrier or Catbrier. The “unarmed” vines, no thorns but smelly flowers, include the words Carrion Flower in their common name. So they don’t sound so attractive. But in fact, these sturdy vines are hard-working, interesting, and valuable members of Virginia’s ecosystems. Smilax flowers consist of small green clusters on separate male and female plants. They are inconspicuous on the thorny species. But the Carrion flowers form large spheres that grow into showy orbs of shiny blue-black, pea-sized seeds. Both types are pollinated mostly by flies. The leaves are characterized by parallel venation, and the base of the leaf stalks remain attached to the stem after the leaf drops. The vines of the thorny species remain green all winter, and sometimes retain a few leaves as well. Smilax can sometimes form thick colonies and retard shrubs, but this is part of native plant’s co-evolution, as long as it is happening in a natural area. Like any other vine, it may need to be controlled in a limited or managed space. 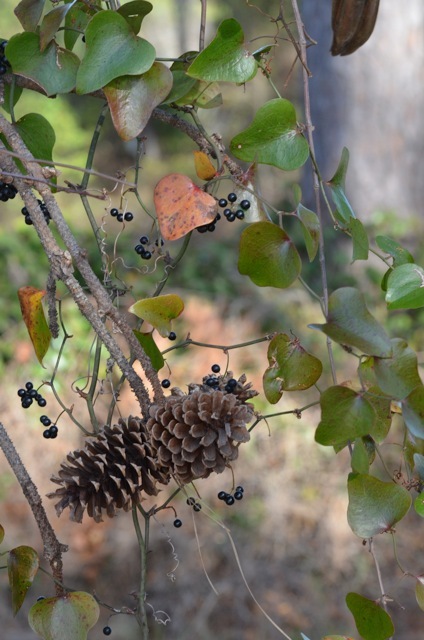 Smilax berries are one of the more attractive features, both for people and wildlife. Most of them are blue-black, but a few, like S. pumila, S. auriculata, and S. walterii , sport red fruit. 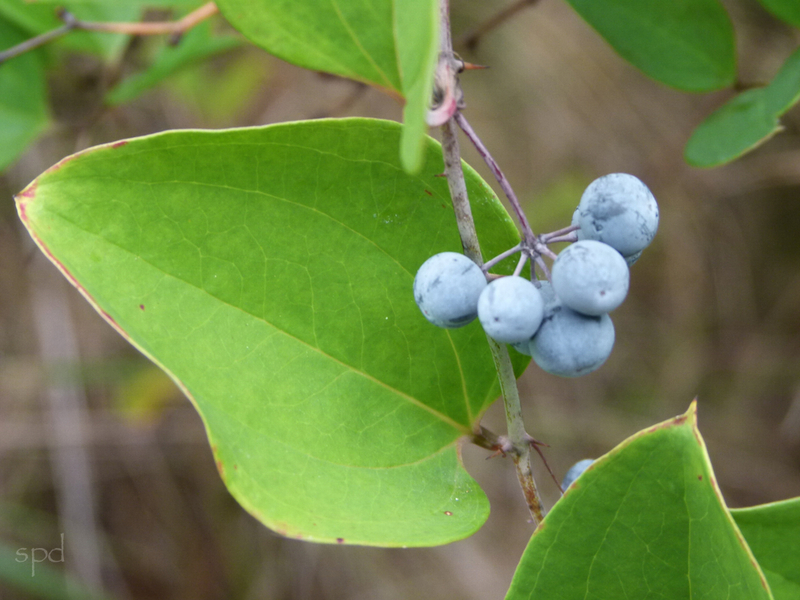 Although the Smilax species vary in lipid fat content of their berries, they are all an important source of winter food for birds, including grouse, mimic thrushes, robins, and red-bellied woodpeckers among many others. Black bears (Ursus americanus!) eat them, too, and occasionally foxes, squirrels and opossums. The flowers are visited by a number of bees and flies, for both nectar and pollen, and the leaves are larval host for many species of caterpillar moths including the Curve-lined owlet moth, (Phyprosopus callitrichoides). White-tailed deer, rabbits, and beavers all feed on the woody stems, leaves, and shoots of Smilax. And of course all the Smilax species provide excellent protective cover. Another thing that can catch your attention in regard to Smilax is that some of them are hard to tell apart. Some helpful ID characteristics have been provided here by John Hayden, our VNPS Conservation Chair, and Robert Wright, Environmental Scientist and member of the Pocohantas Chapter. Smilax glauca, Whiteleaf Greenbrier, showing the powdery, waxy bloom that will wear off as berry matures. “There is one surefire way to separate S. glauca from all other Smilax at any time of year: The base of S. glauca main stem is like no other Smilax; it is extremely bristly with many short, terete, dense, needle to awl-like flexible prickles (almost brush-like)—not at all like the mainstem recurved, claw-like spines from which the Catbrier gets its moniker. The similar S. hispida has flattened spines that are usually sepia to black, and are stiffer, but can be brush like. So, yes, smile. It may be smelly or have thorns, but it’s intriguing, beneficial, and native. It’s Smilax. This essay settles it! Thank you to the quartet who prepared it and to Shirley Gay, for sharing this convincing explanation regarding the “thorn of contention” between us neighbors! I confess to having torn out enough smilax here and on Cape Cod, “cleaning up the woods”, to burn in horticultural hell! Mea Culpa and I promise to reform and to respect this contribution to plant heaven, our ecosystem! Elaine, thank you so much for taking the time to share your experience with us! In the vast and quiet recesses of cyberspace it’s wonderful to receive the affirmation of a reply like this one. Thanks for all your good work up on the Cape. Thanks for this explanation. 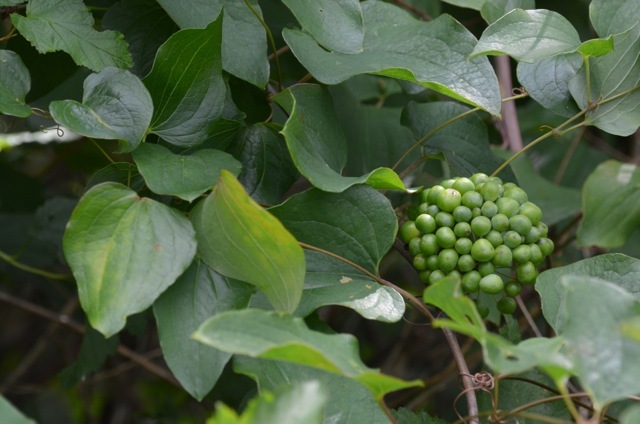 I live in the Virginia beach countryside and I think we have a number of Smilax species. I am trying to learn if all Virginia Smilax sp have edible tips and berries and root. Can you advise?